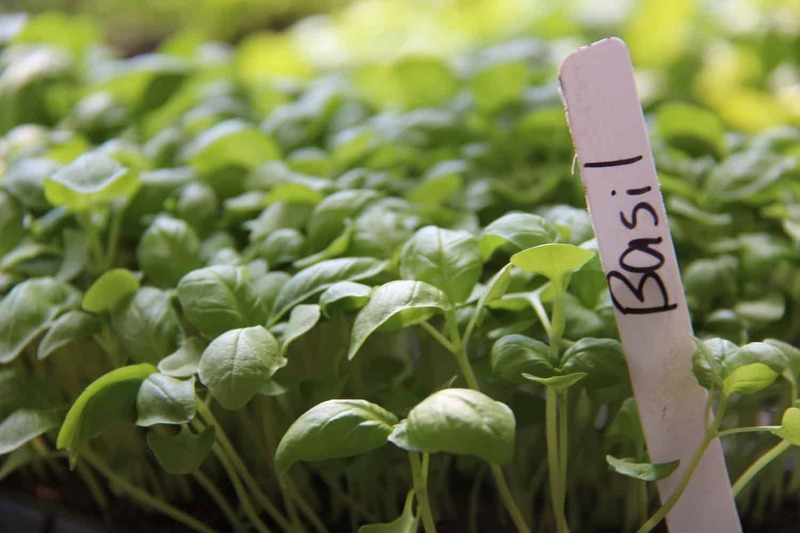 Basil is an easy, delicious culinary herb to grow indoors. Growing basil from seed is a lovely gardening project that will also add flavour to your cooking. Start growing basil indoors, and you’ll find it is just as enjoyable as it is delicious! Learning about growing basil from seed is a great project for home chefs. If the process of growing basil seedlings seems too long, remember that seedlings in containers are also commonly available for purchase in nurseries and grocery store produce sections. Fill the container with the potting soil. Moisten the potting soil so it is damp, but not wet (muddy). After moistening, the soil should reach approximately 1″ from the top of the container. Place basil seeds on the soil about 10 cm (4″) apart. Lightly sprinkle 1 cm (less than 1/2″) of soil on top of the tiny basil seeds. Gently water the soil until top layer of soil is saturated. Place the container in a warm sunny area or under a plant light. Keep the soil moist and warm while the seeds germinate and sprout into basil seedlings. You’ll have germination problems if the environment is too dry to support growing basil from seed. Water the sprouted seedlings regularly as they become established. Once the basil seedlings have become established, watering can be reduced. At this point, wait until the soil becomes dry before watering the plants again. Basil can either be harvested as a microgreen or when the leaves are fully grown. Basil can be harvested as a microgreen once it is several inches high. If you have many basil seedlings, save a few to allow to grow into large plants, and use the others for microgreens. Basil microgreens make a lovely garnish on pasta or a perfect addition to a tomato salad. 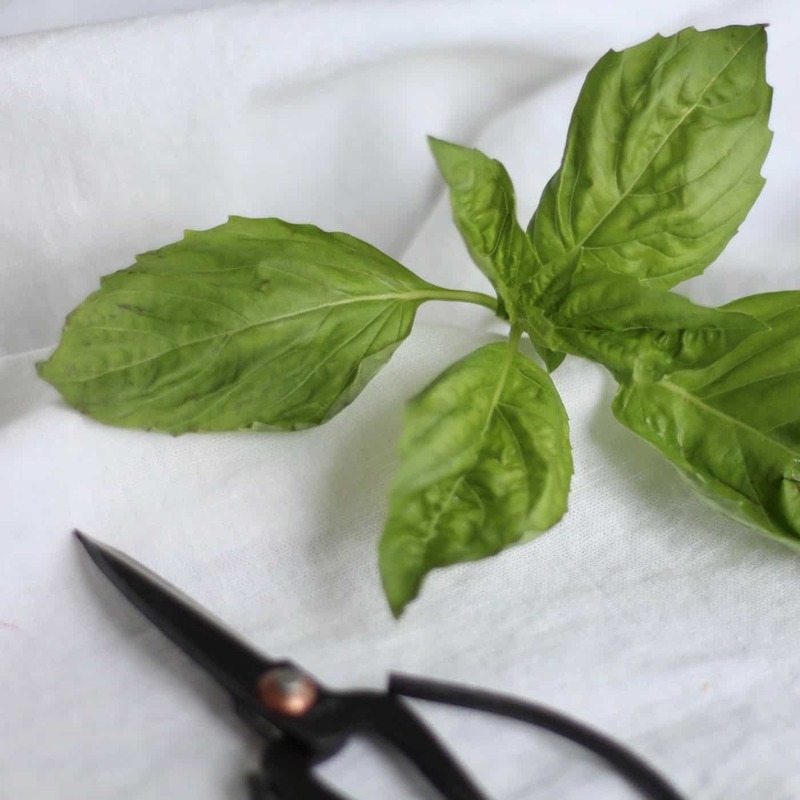 Mature basil leaves can be harvested when plants reach about 6” or 15 cm in height. Try to harvest only a few leaves from each shoot each week. Harvesting all the leaves from a single small basil shoot may prevent it from growing more leaves in the future. Mature basil plants will appreciate a bit of plant food to thrive. 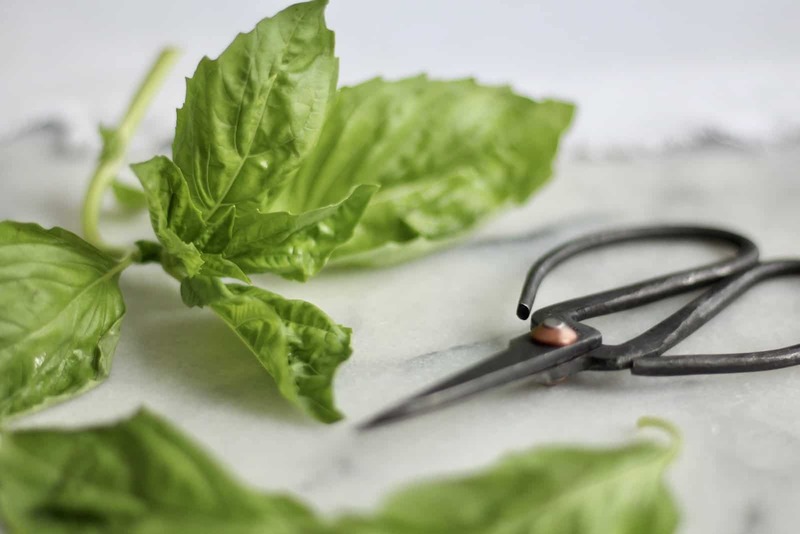 Pinch off the top of the shoots of mature basil plants to encourage the plants to produce more leaves. If you would like to collect seeds, allow the plants to flower (do not pinch off the top of the grown shoots). Download a printable cheat sheet of these instructions using the form below. Print them out, use them as a shopping list, and keep next to your container garden. Basil plants are fairly short-lived, so it’s good practice to re-seed every few weeks to ensure a healthy supply of fresh basil. As your basil plants age and try to flower, they will stop producing as many leaves. It’s time to re-seed! Growing basil from seed requires frequent re-seeding due to the short lives of the plants. The basil seedlings will require water more regularly than the established plants, so take care to give both the seedlings and the established plants the care they require. For your potting soil, choose a well-draining variety. Some high-quality potting soils are specially formulated for growing plants from seeds. These “seed-starting mixes” are perfect for growing basil from seed. Be sure to check the mix you purchase to make sure it is actually organic. I use Pro-Mix Organic Seed-Starting Mix for my basil seedlings. Read more about organic gardening (versus conventional gardening) here. Check that the container you’ve selected has a drain hole to allow excess water to escape. Basil plants will “drown” if their roots become waterlogged. Plants require air in the soil as well as water. Saturating the soil for an extended period will suffocate the plants. There is not much room for air in the soil if it is saturated with water. The only time basil seeds will put up with a little extra water is during the initial germination phase of growing basil from seed. Once roots are established, let them dry out a bit between waterings. Can you grow basil indoors? Yes! – with a few tricks that mimic nature. Growing basil indoors rather than outdoors does require some special considerations. The most important consideration is providing enough light. If you have a bright sunny window, place your basil plant where it will get lots of light throughout the day. Keep in mind that basil plants love 12 hours of light each day, and need at least 4-6 hours of direct sunlight to thrive, so ensure you’re selecting your window carefully. If you’re at all doubting that your basil is getting enough light, get yourself a plant light. You can either buy a fancy plant light set-up, or just a regular fluorescent light. Lately some indoor gardeners have been moving towards inexpensive and compact LED plant lights. Place the basil plant right under the light so it can soak up all the rays. You may also want to consider other environmental factors such as heat and humidity. If your plant is very close to a drafty window, it could be negatively affected by the cold. Basil also may be affected by indoor humidity. The dry winter air in heated homes can desiccate the soil and dry out the plant. Consider using a humidifier if the air in your house is particularly dry. Lastly, growing basil from seed (or from basil seedlings) benefits from some sort of air movement. If your house doesn’t have an active air movement system, a fan may help to simulate the outdoor environment. Air movement will help your basil seedlings grow strong sprouts and also discourage pests and disease. In general, basil leaves taste the most delicious right before the basil flowers appear. Once basil flowers appear, the plant is already putting it’s energy into creating seeds rather than producing flavourful leaves. 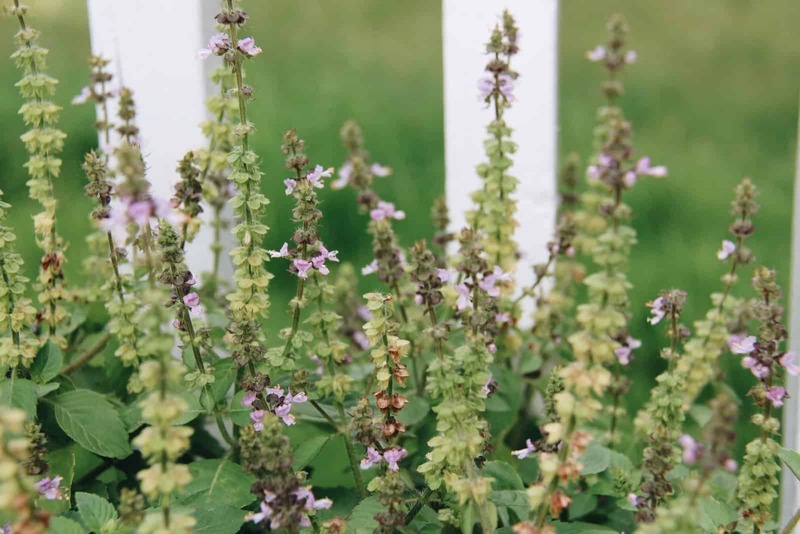 Once you’ve grown a few plants, you’ll start to notice when the basil plant looks like it’s going to flower. It gets less bushy, with a prominent vertical shoot. Pinch off the vertical shoot right above the smallest baby leaves to encourage the plant to stay bushy and keep producing leaves. If a flower is allowed to grow rather than being pinched off, it will grow a small seed pod full of basil seeds. If this does occur, you can collect the seeds from the pod and use them to grow new basil seedlings (or use them in place of chia seeds!). Flowering basil indicates the plant is near the end of it’s life. It’s making basil seeds to create offspring basil plants. Since basil is relatively short-lived, it’s clever to plant new seeds every few weeks so you’ll always have a fresh crop. Basil plants require nutrients to grow flavourful leaves, in addition to bright light and clean water. If you’ve purchased an organic potting soil for your indoor basil plants, it may or may not have added organic soil amendments, plant food, or fertilizing nutrients. If your soil does not have added nutrients in it, you may wish to use some organic plant food to feed your plants. My favourite indoor soil amendment is worm castings. Worm castings can be produced at home with your own worm bin or purchased as an organic fertilizer. You can also purchase containers of pre-mixed organic plant food from a local independent garden centre. Even if your potting soil contains nutrients, you may wish to feed your plants once you’ve been using the same soil for growing basil from seed for a few months. 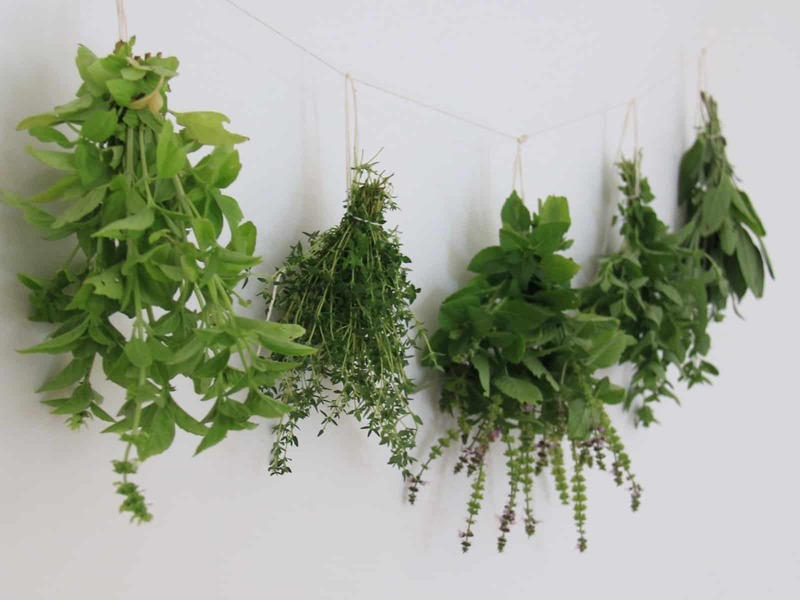 What herbs do you grow for your kitchen? Which are your favourite to use in your go-to meals? Have you tried growing strawberries indoors yet? Share in the comments below! I live in an apartment so I NEED to learn to grow herbs indoors. Thanks for the tips- pinning so I can stop killing my herbs! I love this idea, and I would love to try it out! I adore basil, and would love to have it fresh all year. I usually grow so much in the summer and then try to figure out how to have some in the winter, so this is right up my alley! Thanks for this post! I love having fresh basil! This is super helpful! brilliant advice thanks, I never new that when the flowers appears it was near to the end of its life. I love fresh basil and would mine to last longer. I usually get mine from the super market but i never re pot it just leave it in the plastic pot, maybe i need to give it a little more care . Thanks again. What an awesome post! I love having access to fresh basil. We grow genovese basil as well as lemon basil in the garden but I have wanted to bring them indoors! Such yummy types of basil! Having fresh basil is the best :) Thanks so much for stopping by! This is such a helpful post! I find that every time I try to grow basil indoors, it is so finicky! Thanks for all the wonderful tips. I have a couple of 4′ 6400K T5 bulbs with reflectors spaced about 4 inches from each other, and about 3 inches above my basil seedling cells. Is that a good height above them? After 2 weeks, all are looking pretty healthy, but some of the leaves aren’t quite as dark as the others, but not super pale or anything. It’s not too noticeable, but just wondering if that would be a nutrient issue (I fed them some dilute (to 2.5-2.5-2.5) liquid food yesterday, or could be lights be too close? Great article. 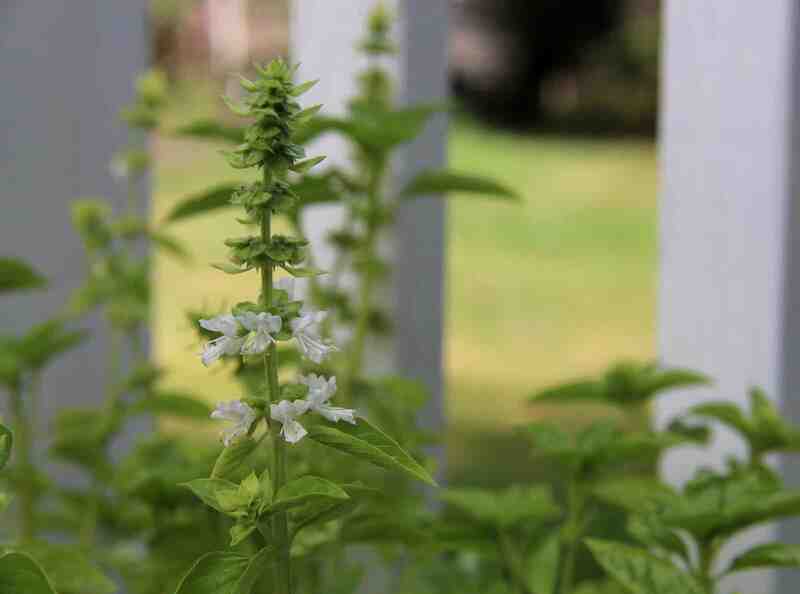 basil acts as a medicine and inhibitor properties, holy basil provides all of those advantages.